Best way to start off the summer? Make sure the house is fresh and clean! The warm weather brings family reunions, pool parties, and summer barbecues; all of which require a clean home for hosting. The sooner the task of cleaning is tackled, the quicker the house is ready for summer entertainment with friends and family. With our tips, any home – no matter how big or small – can be tidied up in no time. 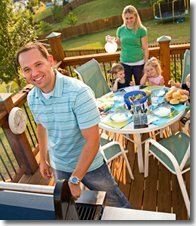 • Outdoor grilling is a summer staple, but making sure the grill is clean after a long winter of non-use is essential. Protect your charcoal grill from rust by cleaning out the ashes regularly. Remove the grates from inside (when the grill is both off and cooled) and remove the ashes from the bottom of the grill. Place the stainless grates on newspaper and spray with oven cleaner. Let it work the recommended time and wash with warm soapy water to remove remaining grime. 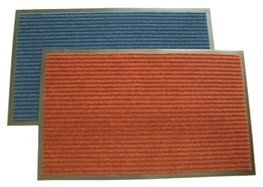 • Mats make a difference. With kids out of school, the traffic level in your home is about to increase greatly. A simple nylon mat will catch a surprising amount of dirt. Put one at each doorway, especially where kids enter the most. Consider making a no-shoes rule in the house to further reduce incoming dirt. 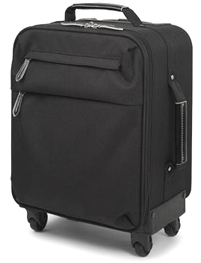 • Summer holidays mean traveling, so your luggage and travel bags must be clean! Vacuum accumulated dust from both the inside and outside of the bag. Clean the outside with a diluted mild cleanser (except for leather bags, which need commercial leather cleaner). A musty-smelling inside is instantly cured with a vinegar-water solution, but be sure to let the luggage air dry for a couple days before using. When storing the bags until your next vacation, place a small box of baking soda inside of larger bags to absorb odor and moisture. • Don’t forget: Your windows must be cleaned every season. Use ¼ cup of an all-purpose cleaner in a bucket and scrub the screen on a flat surface, without the screen on the window. Spray the cleaner off and shake the excess water away, then put the screen back into place to dry out. • Air conditioning is always a healthy household helper during summer because it keeps the dust and the pollen outside – resulting in a reduction of allergies. If you like a natural breeze, use window filters that keep airborne particles and dust out of your home. Whether using air conditioning or heating, you can place filters in your air duct registers to keep dust out of your home. 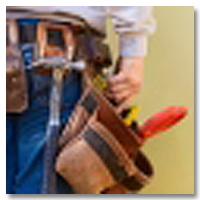 • Business is slow for maintenance crews throughout late summer, so look for discounts on all home services. Services such as gutter cleaning will help prepare your home for summer thunderstorms. Also schedule your furnace maintenance to ensure you are warm on that first cold night of fall. Clean with Microfiber Products – Tips from a Professional Housekeeper! For your home cleaning needs, call the professionals at Molly Maid. Call (800) 654-9647 now to connect directly with your local Molly Maid. Each maid services team comprises insured, licensed, and uniformed housekeepers who are regularly supervised. Click here to request service in your area.